We had a very successful tour and open house of our rapidly expanding West Virginia location. 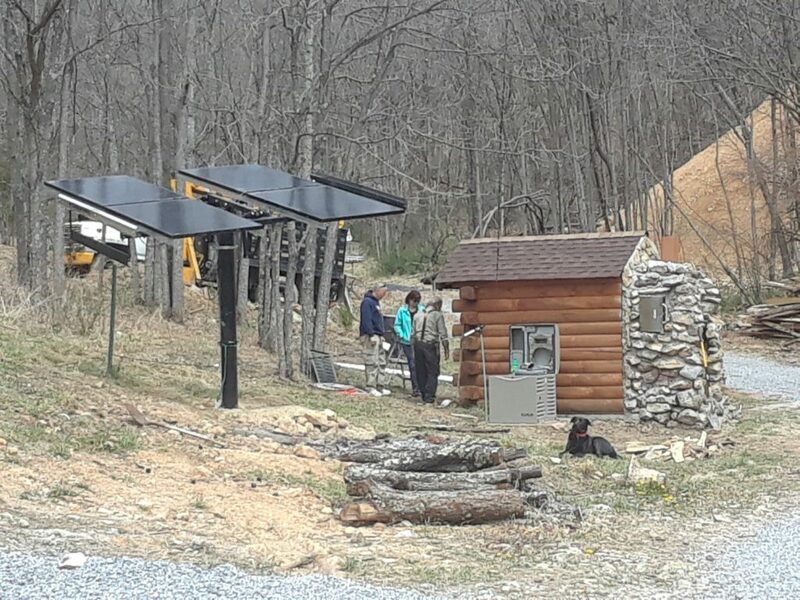 The photo below shows member prospects looking at the inverter, batteries (in the small log building), solar panels and propane generator we just added to produce our own electricity. The rock structure on the right is a huge grill and smoker. We have an agreement with local farmer to buy cattle during a crisis at a premium to market price, and will process many of them into jerky using this huge grill/smoker. 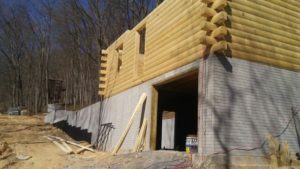 The new “long basement” building is 120 feet long, with a double basement and log home on one end, earth covered center 60 feet of basements (with concrete steel reinforced roof) and a two story log home on the other end. You can see one of the two “treehouse guard stations” in the background. The building makes up a large portion of the outer compound wall. 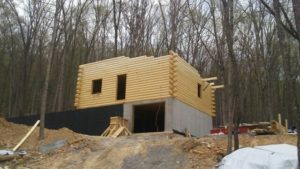 Both log buildings will have an elevated deck, both to enjoy the view of the beautiful adjacent George Washington National Forest and to serve as a guard platform. 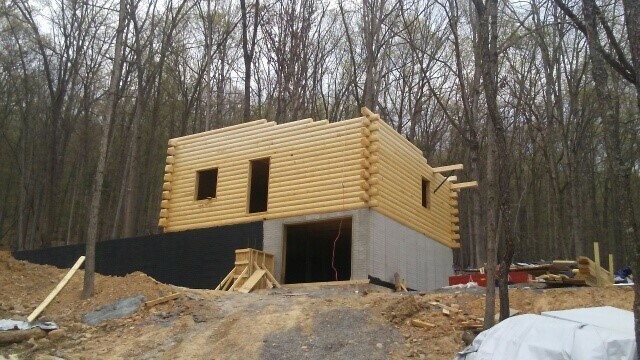 In the photo above, you can see some of the logs extending to support the deck that will wrap around this log building on the upper level. We build out of logs both for beauty, and for their bullet stopping ability. A local TV news channel came out to the WV Open House and did a long segment on Fortitude Ranch. Video below shows a lot of the older shelters at FR WV and some of the new long basement building. They were very impressed with our operation and wanted to have something negative to say so they added the sinister angle of how the locals don’t know that Fortitude Ranch is there. Of course, we don’t advertise our location and are glad that folks don’t know where we are, but it was amusing to see how they tried to paint that as a negative. It is great that we’re getting more publicity and attention. Fox News plans to come out and do a story on us as well. 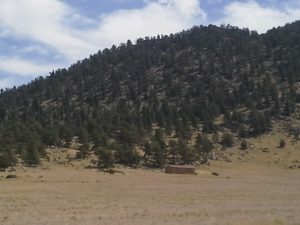 The Fortitude Ranch Colorado open house is set for May 20. Will give an overview of Fortitude Ranch Colorado and planned buildings while walking the future walls/guard stations of the compound. Will also have a short course on treating battlefield wounds, show some of our radiological detection equipment, and our VP for Energy will show some photographs of the FR West Virginia solar/battery/propane generator system similar to what we’ll have in Colorado (adding a small wind generator). If you are interested in attending this, email for directions. Most of our members are busy professionals, who unfortunately don’t have the time to attend open houses or member training and social events. So we are going to be doing more on-line and video conference training, starting with a course in radiation detection and monitoring. As you know, Fortitude Ranch members will help provide guards, cooks, firewood gathering, hunting and fishing, and farm animal care during a crisis. Thus far it has just been staff that is trained to do the radiation monitoring, but many members have asked to be trained in this. This training will be via briefings emailed out and then a video conference. It is only offered to current FR members or FR token holders (must own at least 5). I’m sure you’ve gotten “the look” when you disclose you’re a Prepper and the person lets you know that they think you’re crazy. Many recall some idiot from a Doomsday Prepper’s episode, failing to realize that this show did not show the typical smart, serious prepper, but people who were put on TV to look stupid. When a pandemic starts spreading or our vulnerable electric system fails, the 98% who have neglected preparation will realize we were right. 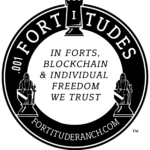 We certainly don’t want folks who were not wise or responsible enough to prepare to suffer and die—but it will be very rewarding to have them begging to buy our Fortitude tokens and join Fortitude Ranch when they are now desperate for protection. 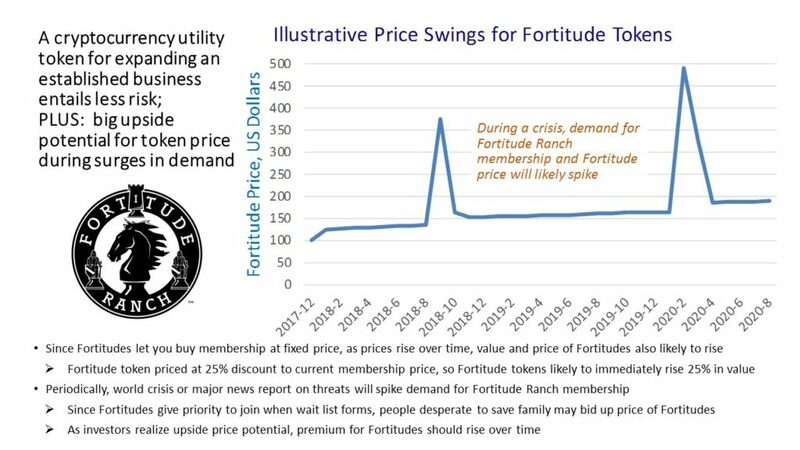 Our “Fortitude” membership tokens were issued in December and January at a price of $100. They are now being sold at $135 and with the great publicity and growth in membership and Fortitude holders, the price is likely to again go up. The most important advantages of owning our Fortitude member tokens are to 1. Have priority to join when wait lists form, and 2. Protection from membership price increases. 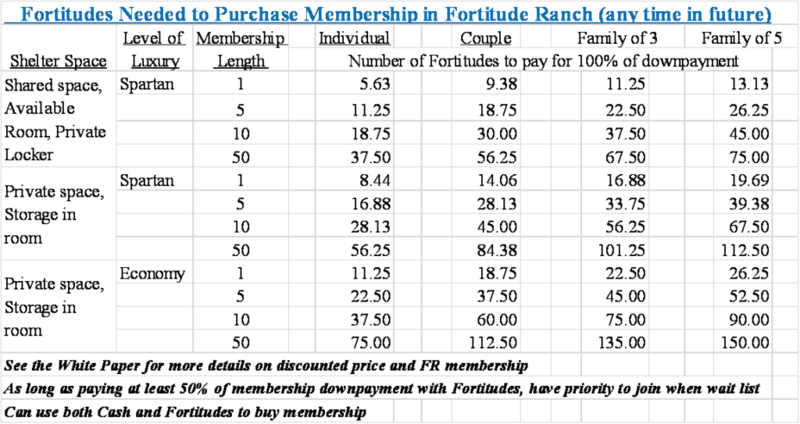 The table below shows the cost in Fortitude tokens to join Fortitude Ranch. This token price is fixed—it will never go up. But our cash price will increase often as demand rises. This is why we highly recommend that if you do not have a FR location near you to join now, you should but at least 5 tokens (individual), 10 if a couple, or 15 if a family to be sure you can join FR. If you want to be able to buy a longer term membership or nicer accommodations, you should buy a larger amount of Fortitudes. You only get priority to join if you can make at least 50% of the initial member payment in Fortitude tokens—else you are on the wait list with other cash buyers. Many people have also bought extra Fortitude tokens either to give to family and friends in the future, or sell as an investment. As the exhibit below shows, we believe that when crises are developing, or a big media event raises awareness of the need for Fortitude Ranch, the demand to join will lead to a surge in the price of Fortitudes since only Fortitude owners are likely to be able to join Fortitude Ranch. What states should we expand to next (after CO and WV)? When would you like to attend member training/social events? What member training topics are you most interested in? Please encourage your family and friends to consider Fortitude Ranch. The more memberships and Fortitude membership tokens we can sell, the faster we can expand, and the more people we can save. You are welcome to forward this newsletter to people who may be interested, and send us emails of people to add to our email list. Download this newsletter in PDF form.